Sanity-inspiring posters to get your life back on track. Modern life is a bewildering mess of loud noise and bright flashing lights, causing many people to feel anxious, confused, and/or riddled with despair. It’s so bad that a few poor souls even get to the point of questioning whether life has any meaning at all. 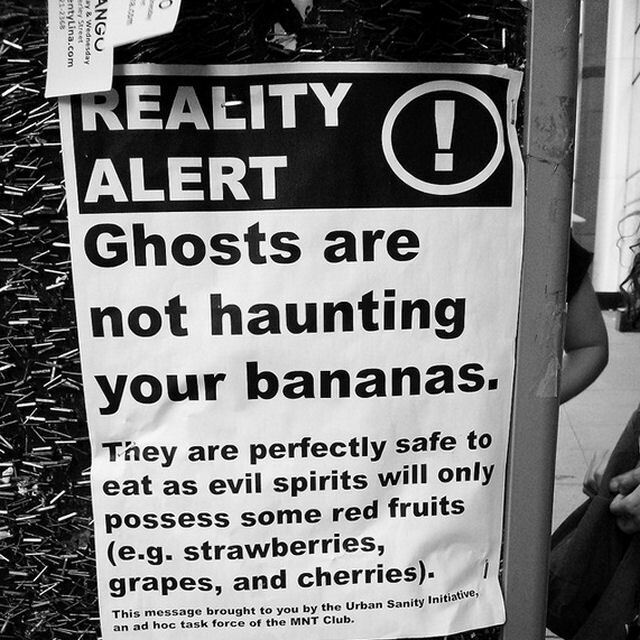 Since this state of affairs must not continue, the Marxist Nudist Taxidermy Club has created the Restoring Sanity Initiative to pull people back from the brink of madness and remind them that no, they don’t have to fear the Lizard People, and by golly, there are no ghosts in your bananas. It’s our hope that the posters we put up will have a reassuring influence, so that everyone feels confident enough to go home at night, tuck some children into bed, and then sneak down to the kitchen to tell the refrigerator there that everything is going to be A-okay, it all makes sense now. Isn’t that the world we should be living in? Thanks to the MNT Club we can at long last throw away our suspicious red fruits and stop straining our necks to eat leaves from the treetops. Truly we owe them our deepest gratitude.